The included study material consists of a comprehensive online practice exam designed to help ensure preparedness for the CDL written exam for Combination Vehicles. 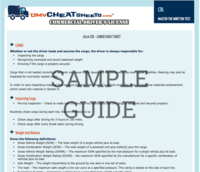 This portion covers material from the combination vehicles section of the CDL manual. The information in section 6 is designed to provide the minimum information needed for driving common combination vehicles. Section 7 provides more detailed information for doubles-triples.